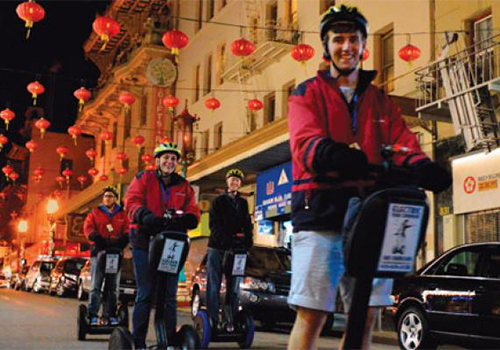 Segway Night Tour of Chinatown, Little Italy, Wharf & Waterfront is not currently available. 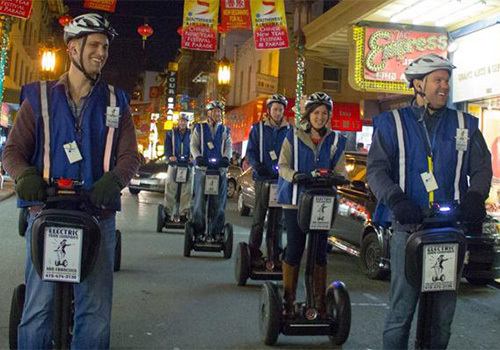 Cruise through San Francisco at night on a Segway in this exclusive tour opportunity. 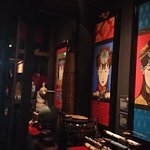 You’ll visit iconic neighborhoods and sites including Chinatown, Little Italy, Fisherman’s Wharf, the Waterfront, and more. Your guide will show you how to navigate a Segway through San Francisco’s beautiful streets and neighborhoods while providing interesting facts about the city. Arrive no later than 15-minutes before your scheduled tour time. Tours include a 40-minute training session. Segway riders must be 12 years of age or older. Riders cannot exceed 250 lbs. Wear comfortable closed toe and flat shoes, and comfortable clothing. Explore San Francisco by Night on this unique and fun-filled tour. Explore Fisherman's Wharf, North Beach, Chinatown and the Waterfront. After a 40-minute training session on how to safely operate the Segway, you will glide through lively neighborhoods for a total of two hours. Each guest is issued a compact radio receiver so they don't miss a detail of what the guide is saying about each site seen on the tour. Numerous stops are made for photos. Fisherman's Wharf & Waterfront: See hidden gems like Fish Alley, Fisherman's Chapel, a WWII Liberty Ship, and the Pampanito submarine. 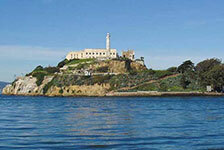 Pause to take in breathtaking nighttime views of the Alcatraz Lighthouse and the twinkling lights of the Bay Bridge. Before returning to Fisherman's Wharf, the tour will loop back from the edge of the Financial District and along the breathtaking Waterfront. Cruise past historic piers along the Embarcadero while the San Francisco Bay glitters against the night. Wear comfortable closed toe and flat shoes. No high heels, flip-flops or sandals. Bring an extra layer of warm, wind-resistant clothing. Rain ponchos, knit gloves, and warm jackets are available for guests to use. Please leave bulky backpacks at home. 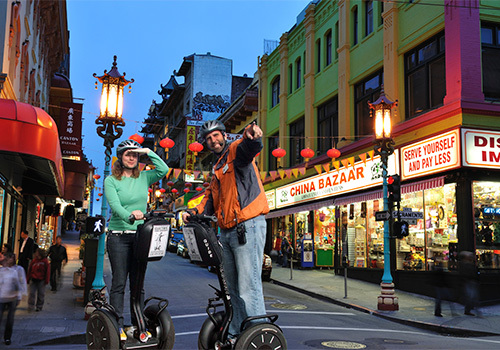 Have you been to Segway Night Tour of Chinatown, Little Italy, Wharf & Waterfront? Share your knowledge and be the first to review this. Including the 40 minutes of Segway training, the tour is approximately 2.5 hours long. 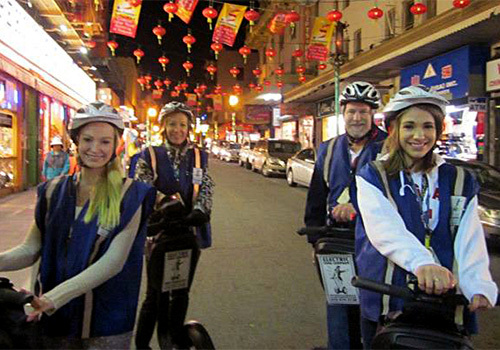 All Segway tours begin at 333 Jefferson St., Suite 123, San Francisco, CA 94133. 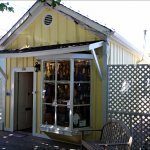 They are located in a walkway that begins between the In N Out Burgers and Sunglass Hut in the Anchorage Square Shopping Center. Alcatraz Island ferries depart from PIER 33, which is a 15-minute walk from the office. Are children allowed to participate in the Segway tours? 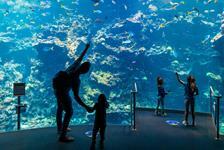 Children under the age of 12 cannot participate in this tour. 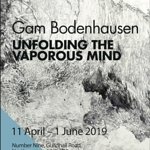 The tour is for ages 12 and up. 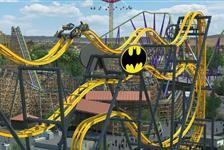 Guests under the age of 18 must be accompanied by a parent or guardian. What are the health restrictions for a Segway tour? 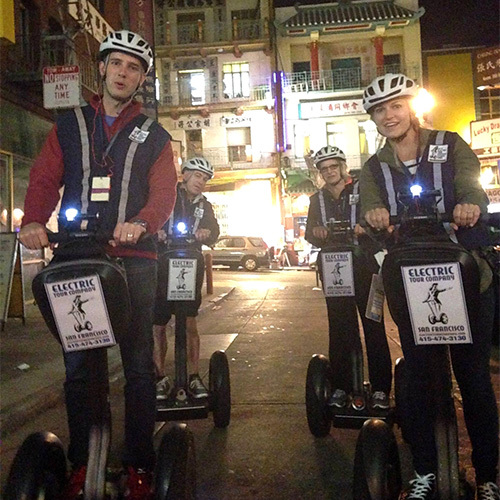 To participate in a nighttime Segway tour, guests must be over 100 lbs (45 kg) and under 250 lbs (113 kg). Minimum and maximum weight requirements are strictly enforced. Pregnant women may not participate in the tour for their safety. The tour is not recommended for individuals with mobility or motor control issues. Guests ages 70 or up should thoroughly evaluate their health and determine if it is safe for them to participate in a Segway tour. Riding a Segway runs the risk of falling. Please keep this in mind when deciding to participate in a tour. What does the Segway training portion of the tour include? Guests will learn how to maneuver a Segway, come to a stop, emergency stops, navigate a safety cone course, and understand the “Share the Road” rules. 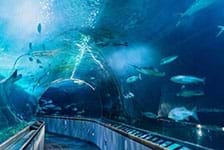 In addition to the thorough training each guest receives, guests are provided a helmet and bright colored reflective safety vest to be worn throughout the duration of the tour. Tour guides are also on hand for any emergencies or Segway navigation questions. No. We do not provide parking for tour guests. Paid underground parking is available at the Music Concourse Garage located between the deYoung Museum and the California Academy of Science. Parking costs are not reimbursed by tour guides. Free street parking is also available on adjacent streets, but understand that these spots fill rapidly on weekends. It is recommended that guests use public transportation on MUNI to access the tour departure spot. The tours operate in groups of 8. Will the tour operate in the rain? Yes. The tours will operate rain or shine. They do have ponchos available for purchase in the office for $1.